Neutral with a hint of perfume / chemical. There are much more interesting Gins on the market. Why bother. Ok so Gordons is the market leader, but it's still a great drink, mixed with tonic water, it is a classic. If cocktails are your thing, try a Fluffy Duck. Equal measures of gin, whisky and pernod. It just shouldn't work, it should be awful - and yet it works. Somehow because each of the ingredients are strong flavours they seem to balance each other out. My first choice for a pink gin. Not so good for a gin and tonic or to have neat. This gin is like drinking perfume, awful and over rated. I find Gordons a little on the sweet side for my taste. Gordons is cheap gin. 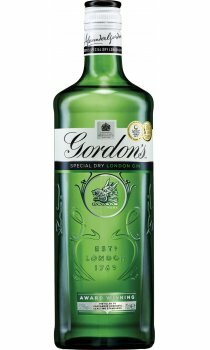 And as such gets a worse rep then it deserves, Ok you cant drink it straight, or in a martini, But if you drink a lot of gin, and put mixers in it, Gordons isnt that bad. There is no point in buying Tanqueray if you are just going to drown it in tonic. A fine gin for tonic, but not quite fine enough for a martini.